Welcome to a tropical slice of heaven at the Windrose Estate. Welcome to a tropical slice of heaven at the Windrose Estate. This Turks and Caicos vacation property offers lots of room to relax in comfort for even the largest groups of family and friends. The estate has been owned by the same family for three generations and its old-world charm has been lovingly maintained in every detail. This Turks and Caicos vacation rental will create truly unforgettable island memories for everyone in your party. The villa estate sits at the center of Grace Bay Beach, voted by Conde Nast Traveler Magazine as the "Best Beach in the Caribbean" on multiple occasions. Twelve miles of unspoiled fine, white sand invites long walks and lazy days in the sun. The bathtub warm waters of the Caribbean beckon right outside your door. Enjoy magnificent views of island sunsets and brilliant blue waters, while inhaling the intoxicating aromas of the tropical flora and ocean breezes. The main house features three spacious bedrooms and three baths. A vast living room & dining room combination provides plenty of room for everybody to relax and unwind. A modern kitchen and laundry room come with every appliance and all the kitchenware, glassware, utensils, towels and linens needed for a care-free Turks and Caicos vacation. An amazing four-side wraparound covered porch offers views from every angle. A Jacuzzi is built in to this verandah, with barbecue grill and patio furniture at hand. An old-fashioned Crow's Nest Cupola sits atop the main villa for watching the ships come in. Relax in the hammock with a good book before a dip in beautiful Grace Bay. Down a small winding path sits the lovely, private Guest House with two bedrooms and ensuite baths. A combo kitchen-living area features modern appliances and all the linens, and kitchenware needed for a private getaway. This charming Turks and Caicos accommodation has a separate beach access if desired and a large covered terrace overlooking Grace Bay Beach. 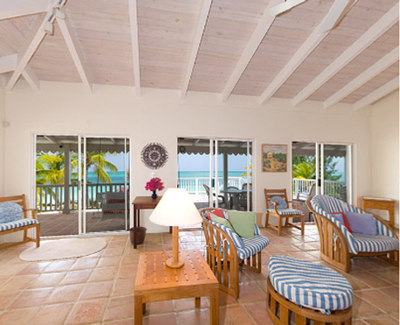 Both the main Beach House and Guest House and Cottage can be rented separately as well.